Speed, accuracy, and accountability for warehouse and distribution organizations mean the difference between thriving as a company and just barely getting by. 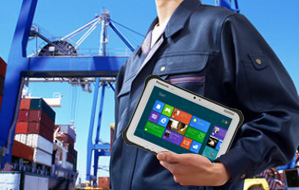 Working with some of the largest warehousing and distribution companies in the US, we have helped them design, deploy, and integrate the rugged notebooks, rugged tablets and support services needed to increase efficiencies, reduce picking errors, manage inventory, and track orders. True Mobility™ is the foundation upon which warehouse and distribution organizations grow and ensure their competitive edge. Every worker on every shift need the mobility solution you implement up and running at peak performance – anything less drains precious time and resources from your workforce. CDCE helps warehouse and distribution companies achieve True Mobility™ and ensure their mobile deployments are optimized and operational 24/7. We provide the industry leading rugged notebooks and rugged tablets, professional installation services, and back them up with our responsive support and services teams. Partnered with CDCE, your teams can accomplish more – more productivity, more revenue, and more satisfied customers. Mounted to a forklift, on a mobile cart, or hanging from your belt, we provide the rugged laptop, rugged tablet, or rugged handheld device solution that fits your workflow demands. We work with you to tailor your solution to the workflow of your teams – enhancing how efficiently and accurately they work. Leveraging our 60+ cumulative years of experience in designing, deploying, and supporting rugged notebook, rugged tablet, and rugged handheld solutions, we are able to adapt and overcome to the issues and challenges of achieving True Mobility™ for our clients, giving them the True Flexibility they need. Providing the reliability and flexibility your end users need, ensures their ability to achieve True Productivity. Their ability to work how and where they need to, means the job gets done, information flows, and your orders are effectively and efficiently satisfied. Achieving True Mobility™ for warehouse and distribution organizations means increased efficiency, reduced picking errors, inventory is managed, and orders are tracked as fulfilled.The rugged notebooks, rugged tablets, and rugged handheld devices we supply, along with industry leading rugged barcode scanners, all add up to success.